Most damage to eye wear occurs when your glasses are not in use. Whether in the home or on the go, having a hard steel core O'Meye® LensGuard case is the best protection for your eyeglasses and sunglasses. To complement this solid construction, all 3 piece sets (other than the Ms87-bkpp) include a Premium-Lens® microfiber cleaning cloth and a premium microfiber pouch. The pouch can be used to hold your case, or to slip your glasses into while inside your case to further decrease any movement/rattle in the event your glasses have a little extra room inside the case. 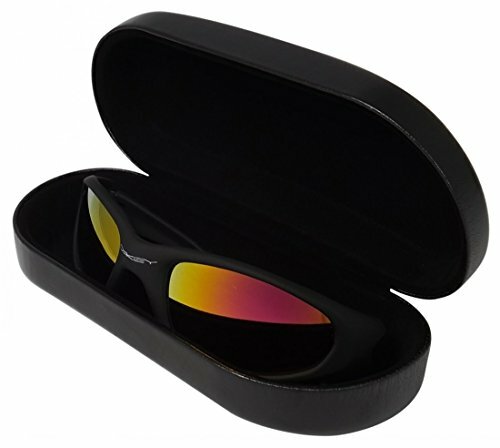 In addition, the pouch can be used to protect your glasses for those times you want to take your glasses off, don't have your case handy or when simple lens scratch protection is sufficient. * Comes With the O'Meye® 120 Day No-Hassle Free Replacement Guarantee! Don't Wait! Get The Ultimate Protection for Your Large Eyeglasses and Sunglasses Now by Getting this 3 Piece Protection Package Today! Made From Premium Quality Materials With Expert Craftsmanship all O'Meye® Cases Come With a 100% Satisfaction - 120 Day No-Hassle Replacement Guarantee! OUR CUSTOMER SERVICE IS DEDICATED TO GETTING YOU THE RIGHT CASE FOR YOUR NEEDS: If you ever have ANY questions about sizing or anything else please email us! To View Our Other Extra Large Cases Click the MeyeCase Storefront Link Above and Review Models OM95 (for additional colors), OM99 (XXL), and the MASSIVE MS87MAX(XXXL) which is guaranteed to fit ANY fit over style sunglasses or safety glasses. If you have any questions about this product by O'Meye, contact us by completing and submitting the form below. If you are looking for a specif part number, please include it with your message.